Just before the westerly gales arrived Bodo was lucky enough to catch the last of the easterlies on Muriwai Beach. He sent in the following catch report and pic. Unable to sleep properly on Monday morning, May 13, I went on the internet to that awesome weather website at the Manukau Heads. Taking one look at the direction of the wind, easterly, and the strength, 8 to 10 knots, my eyes lit up like a Christmas tree. It took me only thirty minutes to get ready to head off to Muriwai and that included having breakfast. By daybreak I was on the beach and it looked perfect. In no time the Flexiwing Kite and Skyhook were up and away then horror struck. I had forgotten the float bottle to keep the kites at legal height and the hooks in the water. What now? I looked everywhere but there was nothing I could find beach suitable to use as a float. Then I had the brainwave of the day, the thermos full of hot coffee! I quickly took off the strap and connected the flask to the bottle loop. I set the gear out 100 metres and I had another look at my 5 hooks with mullet bait bouncing along the beach. The bottle needed more weight. I added a couple of heavy sinkers to the clip on the bottom of the thermos and it worked great. Pic Above : Bodo, who fishes by himself, had to flag down a motorist on the beach to take this photo. The chap was in an obvious hurry, so Bodo did not have time to wash the sand off the thermos or the 4.3 kg snapper. Two sets of 5 hooks was all I had time for and I wound up with 4 snapper, the biggest at 4.3 kg (see photo) and 3 kahawai which I released back into the sea. It was a good day. Before going home I had a cup of coffee. Amazingly the coffee was still hot even after being in the sea all day. During the height of the gale force south westerlies we received a report of a magnificent catch taken at Te Arai Point on the east coast north of Auckland. While we have not yet received the full details it was reported that the kitefisher caught a 17 and 19 lb snapper, several 7 to 8 lbers, with the rest of the catch comprising of several 35 to 40 cm snapper. Paul Morris is currently compiling the full catch report with pics, hopefully we will have them to post online in next weeks newsletter. We have always done very well from Te Arai Point to the Whangarei Heads in winter and this could be a sign of things to come this winter. It may not be for the faint hearted however, as in our experience it seems the worse the weather conditions are the better the fishing. In milder conditions the best winter fishing in this area is around dawn or dusk, personally we prefer dusk, although it is quite important to get your kite up an hour before sunset as the wind seems to drop at ground level for three quarters of an hour either side of sunset. A visitor to the shop this week drove south from Glinks Gully towards the North Head during the last lot of easterlies. He reported that he fished 15 kms down the beach and caught a bag limit of 30 to 40 cm snapper. On the way back he stopped and chatted to everyone else fishing and he reported that everyone, except for 3 kitefishers, had similar catches to himself. The 3 kitefishers had well and truly hit the jackpot! They were all fishing side by side over a couple of kilometres along the beach and each had caught multiple snapper between 15 and 25 lbs. One of the kitefishers had only 3 snapper in his fishbin and it was overflowing. The most successful of the 3 kitefishers had 7 snapper over 15 lbs each with the biggest estimated at about 25 lbs. Well it wasn't a very good weekend for fishing down this way. Saturday arrived with NW wind gusting up to 120knots hence no one on the beach. Sunday was a little better but still with strong NW winds. One of our locals Trevor Sciascia, who recently purchased a Kite Longline Rig and was itching to get it out to sea, went out despite the gale force conditions. 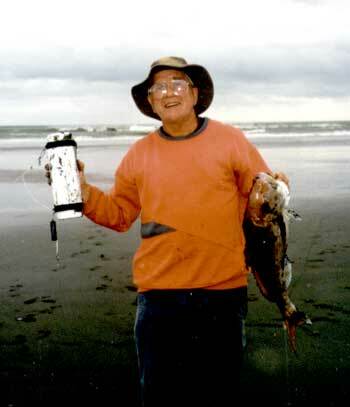 In the howling winds he managed set the gear out and even caught a few kahawai. He was using salted trevally baits. The wind was so strong it eventually broke his 10mm wooden spreader spar on his Super Kite. Paul Barnes says that this is supposed to happen at around 15 to 20 kg of pull, it generally takes a windspeed of 50 to 60 knots to generate this amount of pull and I imagine Trevor was fairly happy that he didn't have to pull in the kite while it was generating that amount of lift. Once the safety cross spar breaks the kite falls into the water and is easily recovered as it folds up and reduces water resistance. Paul recommends that if you are going to fish in extreme conditions that you always have spare Tawa dowel safety spars and a safety trace on the kite. Doug Bassett arrived on Sunday and purchased a Super Kite. Doug too found the wind a bit on the strong side, but managed to launch his Super Kite with some success, namely a few gurnard, spiny dogs and a kuta. The Cray's are still on, down our way, that's if you can get out sea as at the time of writing this we have 5 metre swells on the beach. I had a report from the Chatham Island Cray fisherman this morning, they are having 7 to 8 metre swells down their way and have had big seas all month, hence very little time on the water. If anyone is looking for wet weather gear or rope we now have a supply of both in stock. We also have a full range of Paul's Kites and accessories.